The katakana letter "Ga" in mega man is missing the little line that comes out of the top of the letter...right now, it looks like the kanji "katana" with two dots on it. they'll be gone in the colored version anyway. bleh, kinda lost inspiration. could be better. This is really neat, it looks like one of those cells from an animated movie or something. I love glowing stuff in the dark. 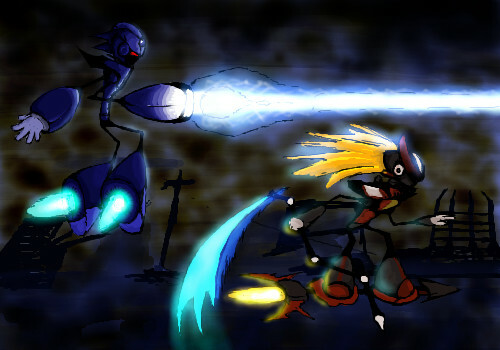 Megaman is: Small, blue, and will kill you to take your powers!! Wo0t. The Shining, the Shading. Wonderful! Stickfigure-like and the characters being pixel-ish, but still wonderful. Wow, great job on that light beam. This is so cool do more like it. SWEET!! mega man is so friggen awsome!!! !